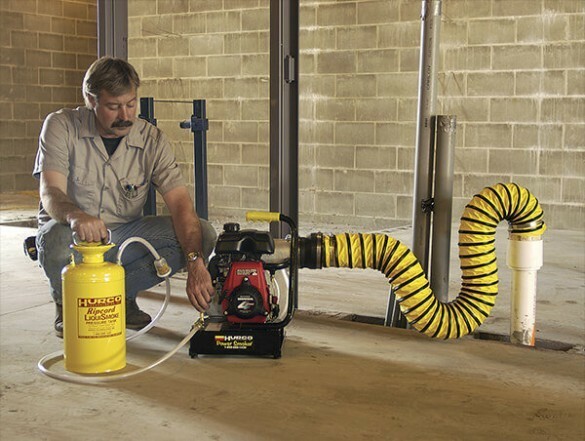 Sewer Gas & Odor Detect | Select Trenchless Pipelines, Inc. Depending on the specific circumstances, the exiting smoke can indicate the location of broken pipes, manholes and catch basins; or where roof or foundation drains might be connected to the sewer system. This indicates where infiltration or inflow might enter the sanitary sewer system. During the testing, smoke will typically appear from roof drains, catch basins or yard drains connected to the sewer system. The smoke may also appear from cracks in the pavement above the sewer, from landscaping above private side sewers, and around homes with foundation drains connected to the sewer. Under some conditions, smoke may also appear in basements through unused floor drains, disconnected or faulty plumbing fixtures or other direct openings to connecting sewers. Visibility and odor last only a few minutes with adequate ventilation. This smoke is nontoxic, harmless and creates no fire hazard. Typically local fire and police authorities are notified and the inspection team is available at test sites to answer questions during the smoke-testing. What sets Select Trenchless Pipelines apart from rest? We only use laboratory tested LiquiSmoke. It is the safest and cleanest way to smoke test commercial and residential buildings. LiquiSmoke DOES NOT contain toxic compounds like “zinc chloride” (the active ingredient in smoke bombs). Click the link at the left side of the page for a MSDS report and testing summary on liquiSmoke. Restaurants are notorious for rotten traps under floor sinks and floor drains. Select Trenchless Pipelines can easily identify failing trap primers,cracked or broken vent lines, missing clean out plugs. Smoke testing can be used to inspect HVAC systems, tanks and just about anyplace where water testing is not appropriate or a quick test is needed.